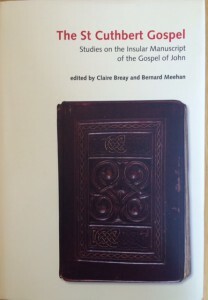 I have already written about this gem of a book on my blog here, but this blogpost is about fesh studies on the manuscript in a new publication from the British Library edited by Claire Breay and Bernard Meehan – The St Cuthbert Gospel: Studies on the Insular Manuscript of the Gospel of St John. The new research marks the fact that the manuscript has been saved for the nation (it was on loan before). Claire and Bernard have managed to get the very best experts looking at various aspects of the Anglo-Saxon manuscript which was found in the coffin of St Cuthbert. 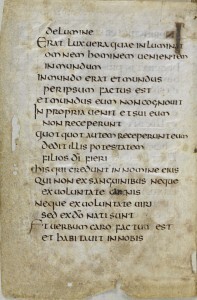 This new book starts with eight enlarged full-colour images of the manuscript. 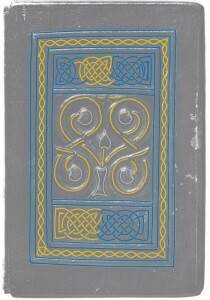 This means that those interested in the binding can really see the patterns which are both indented and also raised on the front cover, and even make out the remains of paint. 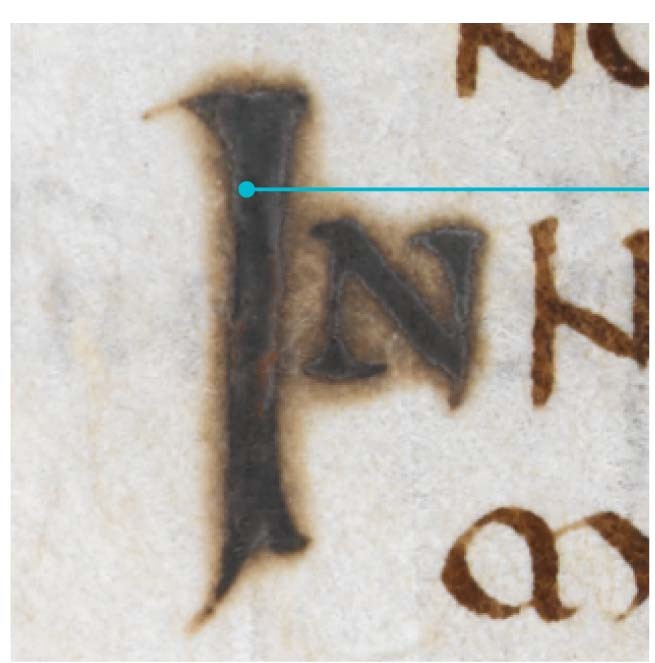 And those interested in the lettering have an excellent opportunity to study the letter-forms closely. The chapter on Materials, Text, Layout and Script by Richard Gameson of Durham is particularly fascinating. 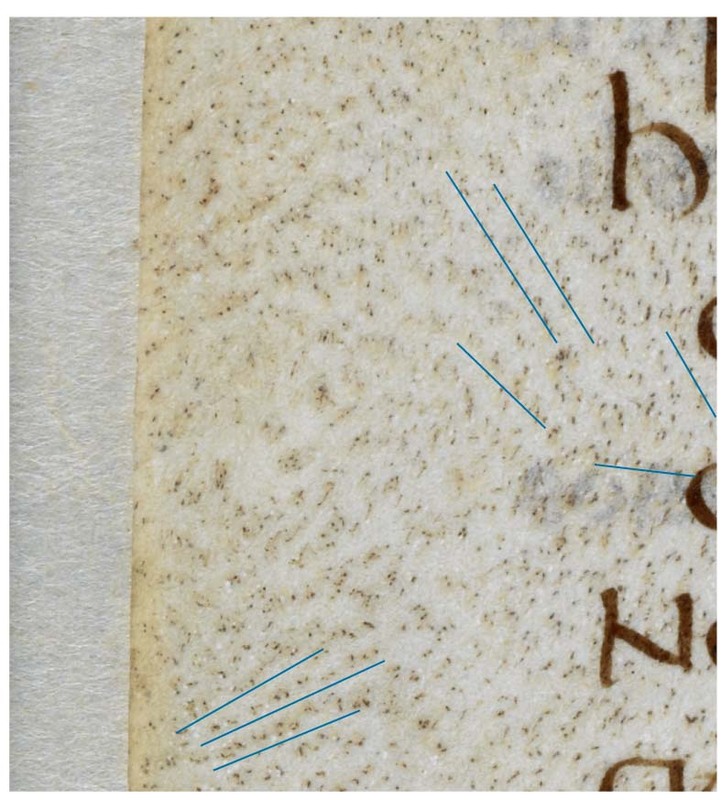 Richard notes that the arrangement of the vellum reflects that which was typical of Insular manuscripts, that is hair and flesh sides on opposite sides of an opening spread. On the Continent, hair faced hair side, and flesh faced flesh side, giving a much more even look to the pages when the book was opened. 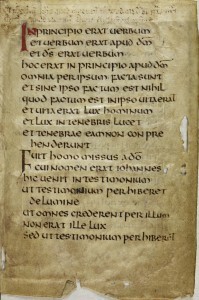 However, unlike many Insular manuscripts of the period, the skin is thin and smooth; usually the skin is thicker and more suede-like in finish. 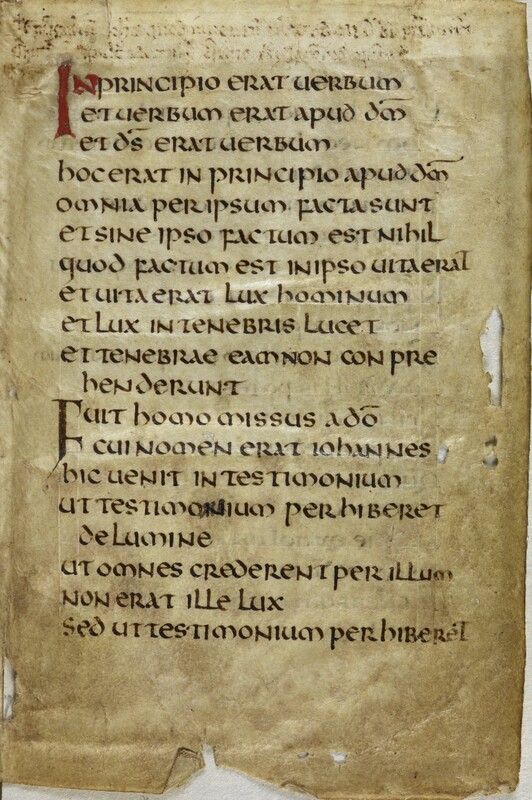 Richard also compares the Uncial style in manuscripts of the time, and includes a photograph of a page in the Codex Amiatinus (previous blogpost here) showing the usual Flat Pen Uncial used in this book with a column of the Angled Pen Uncial of the St Cuthbert Gospel. There is a series of my free Calligraphy Clips showing how to write Angled Pen Uncial here. 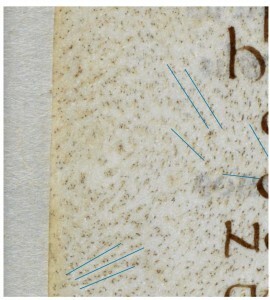 The skin has been identified as vellum. An analysis of the hair follicles shows a pattern of narrow rows of three, five or seven holes which indicates calf skin. This can be seen on the right. Raman spectroscopy has been used to identify the pigments used in the book. Generally the red in the initial letters is red lead, or minium, which has deteriorated in some places to black, as can be seen on the right. Some letters, though, have been over-painted, and vermilion or cinnabar was often used for this. 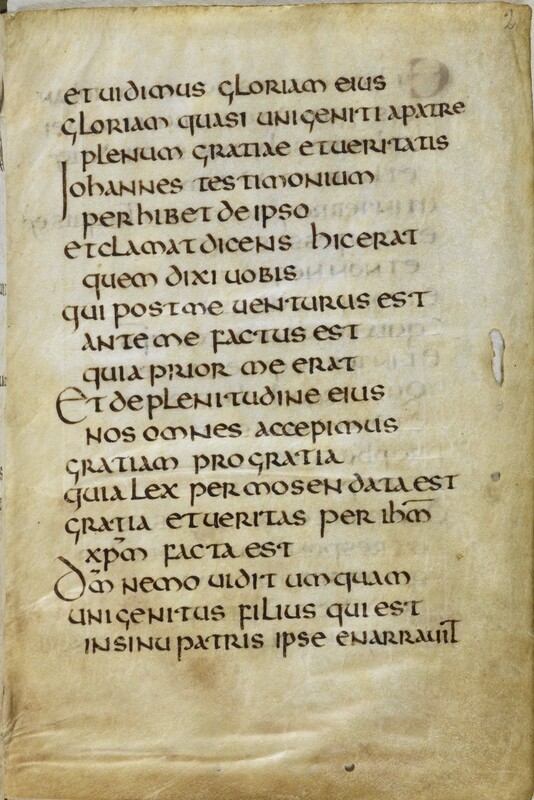 The dark brown ink was identified as oak gall ink from the presence of iron salts. The cover is particularly interesting, and is addressed in the chapter by Nicholas Pickwood. X-ays show that the wooden boards are particularly thin, rounded and chamfered, and the red covering leather particularly thick.This is the earliest European binding and has fascinated many for years. 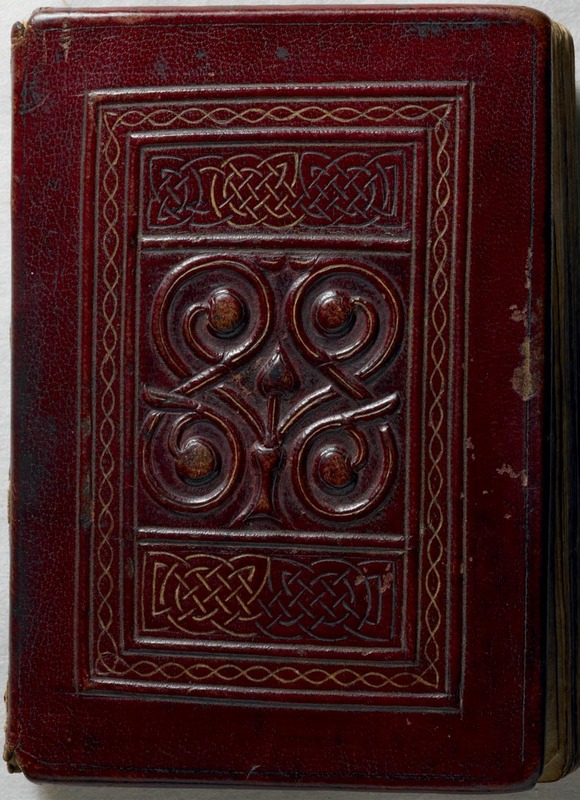 The red leather is, apparently, only surface coloured, yet it has maintained that vibrant pigment which, bearing in mind the age, is quite astonishing.The decoration of the front cover has also intrigued many – how was it done? X-rays again show that cords were used for the outer rectangles but a much more sophisticated and complicated method for the stylised vine central decoration. 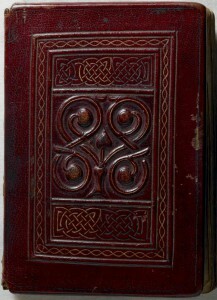 The book is not sewn together on cords but by a sort of chain stitch, very typical of Coptic binding. The whole covering and decoration of the book is very sophisticated and suggests the work of an experienced craftsperson. 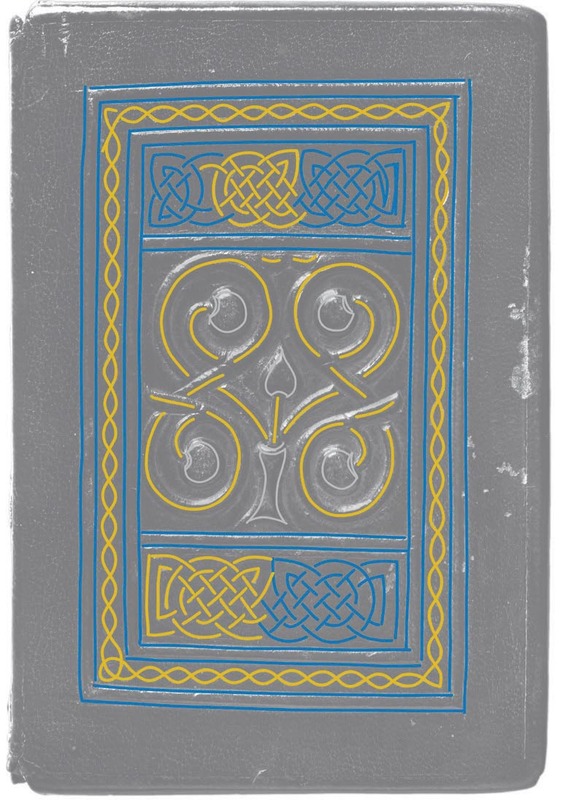 Leslie Webster looks at the meaning of the decoration and the dating of the binding, and compares the intricate interlace, the stepped cross on the back cover, and the vine decoration on the front with manuscripts and artefacts of the period. Raman spectroscopy has also identified the pigments used to decorate the cover as indigo and orpiment. It seems somewhat over critical, but the original painting, when the colours were fresh, may have made the cover rather garish! The lack of symmetry in the upper horizontal interlace border, in a very symmetrical design, is intriguing. This new research in this book, focusing on the St Cuthbert Gospel itself, also includes chapters considering the cult of St Cuthbert, the St Cuthbert relics, the history of the manuscript and Irish Insular Books. This is a terrific and fascinating publication taking a new look at a very old book and one which must surely be high on the list of the treasures in the British Library. 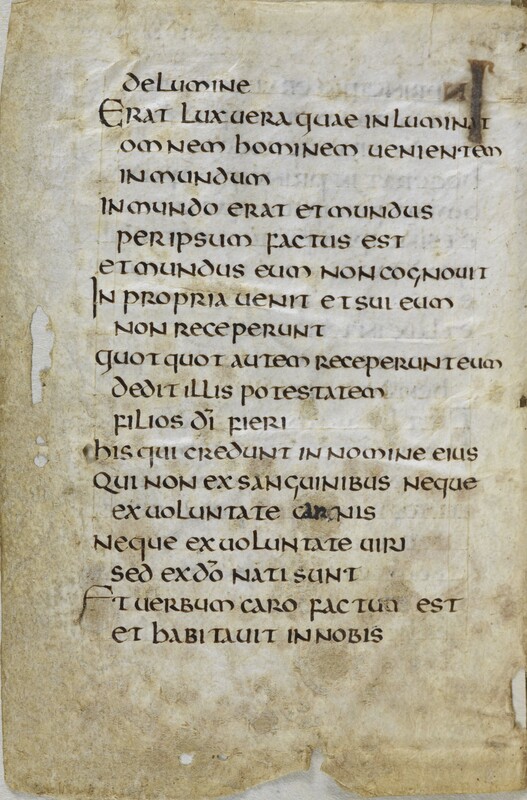 For anyone interested in manuscripts in general, this manuscript in particular, and the ways in which scientific methods can be applied to shed new light on old processes this is an absolute must. I highly recommend this book! To get your copy, click here. 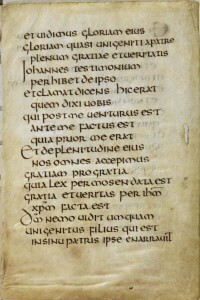 This entry was posted in Blog, Manuscripts, Uncial and tagged Bernard Meehan, British Library, British Library Publishing, Claire Breay, Durham Cathedral, St Cuthbert, St Cuthbert Gospel on 15 July 2015 by Patricia.